Senior business administration major and Rider University Greek Council President Allen Killiebrew (center) was the driving force behind the Cranberry and White Affair. 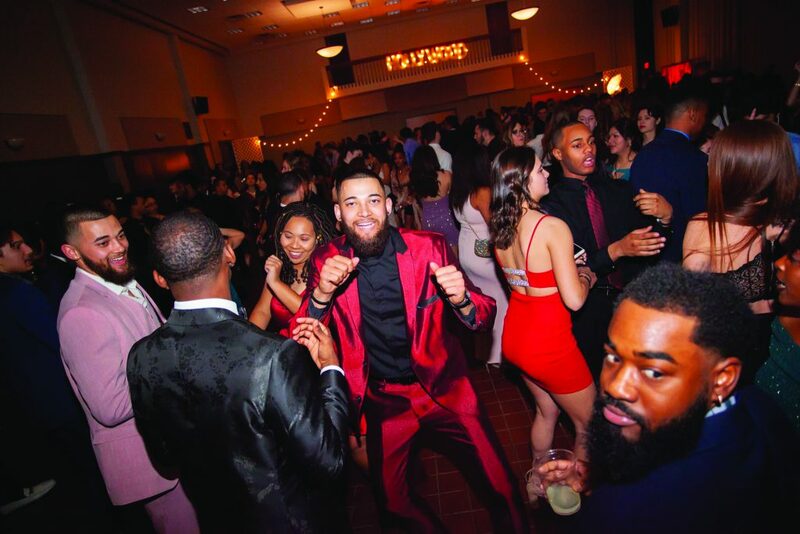 A vision of gowns and suits intermingled encompassed the Cavalla Room for the campus’ first Cranberry and White Affair, a semi-formal dance sponsored by Rider University’s Greek Council and the Office of Campus Life on Feb. 9. Co-sponsored by Student Government Association (SGA), Student Entertainment Council (SEC) and Residence Hall Association (RHA), students were treated to a dance floor and dessert table topped with a chocolate fountain at the free event. Senior business administration major and Greek Council President Allen Killiebrew spearheaded the planning of the function, along with the help of Assistant Director of Campus Life for Activities and Student Engagement Nick Barbati and Office of Student Life Coordinator Naquasia Ramsey-Sheppard. Brainstorming with Barbati, Killiebrew noted that there was a lack of opportunity for non-Greek Life students to attend semi-formal dance events, which were imperative for bringing the fraternity and sorority community together. Putting the plan into action, Killebrew instantly knew who he wanted the co-sponsors to be. “SGA has strong leaders that can make a difference and help get the word out; SEC has hosted successful events in the past and RHA has a great connection with the Rider community through residence halls,” Killiebrew said. Although the sponsoring process was easy to configure, Killiebrew expressed hesitation during other parts of the event’s planning process. Kiera Kulaga, sophomore elementary education major, is a sister of Delta Phi Epsilon and a Rider Bonner Community Scholar. Seeing members of both her organizations in one place was exciting to experience. Not only did the event bring different spectrums of Rider closer together, it also gave alumni the opportunity to visit their alma mater. Seeing older faces in the crowd was as prominent as seeing new ones for many. The attraction of having a photo booth, as well as just spending time with her fellow Broncs, cemented freshman filmmaking, TV and radio major Sarah Waldron’s first year of college into an evening she’ll never forget. Reflecting on his time, Killebrew was grateful for those that made his dream into reality.